Using Grandma’s recipe, this Madison Valley cafe is serving up Southern classics. Simply Soulful, a mother-and-daughter-run cafe serving Southern food, is just about to celebrate its first year in Madison Valley. But, Barbara and Lillian Rambus had already been pedaling some of Washington’s finest pecan and sweet-potato pies at local farmers markets for some years before opening their full-fare diner. The sweet-potato-pie recipe, among others, comes from Lillian’s grandmother, who has tested, tweaked and then inked her stamp of approval on the restaurant’s recipes. 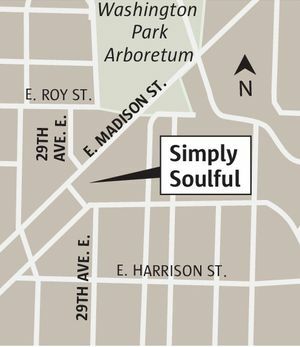 Simply Soulful prepares its food from scratch using fresh and local ingredients, even trading pies for yams from Lyall Farms and rhubarb and greens from Alm Hill Gardens. The menu: All the comfort-food favorites are here: smoky red beans and rice with chicken andouille and cornbread ($11.95); fried chicken wings ($12.95, with two sides) with an optional splash of vinegary hot sauce; and biscuit sandwiches with homemade barbecue sauce, coleslaw and your choice of brisket, pork or chicken ($10.95), a meal that was far too easy to demolish. Weekend customers looking for a larger meal can order a Cornish hen with sage cornbread, mash and gravy ($17.95, with one side, Saturday and Sunday only). Savory breakfast options like shrimp and grits ($12.95) are served all day. For those angling for something sweeter, the cafe also serves pies, cakes and pastries, along with a full espresso bar. What to skip: The sides run small, so they’re a better deal when they come as part of an entree. The setting: A no-fuss, family-oriented cafe in a neighborhood flush with other options, in case you can’t snag one of the 20 seats at Simply Soulful. Summing up: A chicken wing dinner ($12.95), BBQ brisket sandwich ($10.95) and a side order of red beans and rice ($4) came to $30.55 after tax, and fed two.